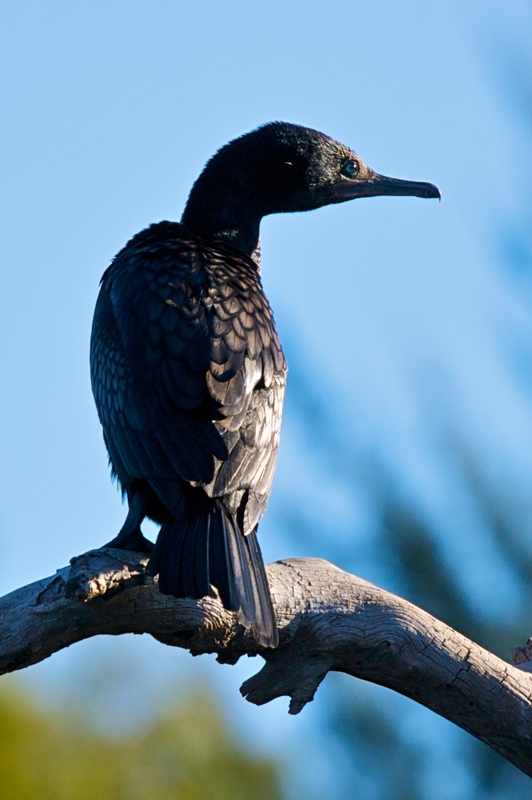 The Great Cormorant (Phalacrocorax carbo), known as the Great Black Cormorant across the Northern Hemisphere, the Black Cormorant in Australia and the Black Shag further south in New Zealand, is a widespread member of the cormorant family of seabirds. It breeds in much of the Old World and the Atlantic coast of North America. The Great Cormorant is a large black bird, but there is a wide variation in size in the species wide range. Weight is reported from 1.5 kg (3.3 lbs) to 5.3 kg (11.7 lbs), with a typical range from 2.6 to 3.7 kg (5.7-8.2 lbs). Length can vary from 70 to 102 cm (28–40 in) and wingspan from 121 to 160 cm (48–63 in). It has a longish tail and yellow throat-patch. Adults have white thigh patches in the breeding season. In European waters it can be distinguished from the Common Shag by its larger size, heavier build, thicker bill, lack of a crest and plumage without any green tinge. In eastern North America, it is similarly larger and bulkier than Double-crested Cormorant, and the latter species has more yellow on the throat and bill. The Great Cormorant breeds mainly on coasts, nesting on cliffs or in trees (which are eventually killed by the droppings), but also increasingly inland. 3-4 eggs are laid in a nest of seaweed or twigs. The Great Cormorant can dive to considerable depths, but often feeds in shallow water. It frequently brings prey to the surface. A wide variety of fish are taken: cormorants are often noticed eating eels, but this may reflect the considerable time taken to subdue an eel and position it for swallowing, rather than any dominance of eels in the diet. In British waters, dive times of 20–30 seconds are common, with a recovery time on the surface around a third of the dive time.